Evangelism is about our relationship to God and those we come in contact with daily. This course connects witness with spiritual formation, leading participants to a greater understanding of the importance of evangelism for all involved. It also incorporates Wesleyan insights for a 21st-century audience. 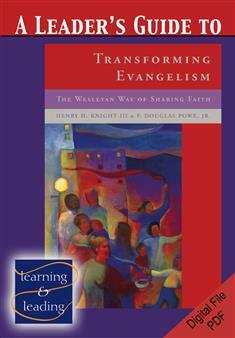 A Leader's Guide to Transforming Evangelism is used alongside the text Transforming Evangelism by Henry H. Knight III and F. Douglas Powe Jr. Available only as a PDF download. Permission is granted to the purchaser to photocopy for educational purposes.